then you’ll love our Essentials Duo Eyeshadow. our Two-in-One Makeup lets you wear each gorgeous shade alone or together for a dramatic effect. Every girl should have staple colors in their makeup bag. 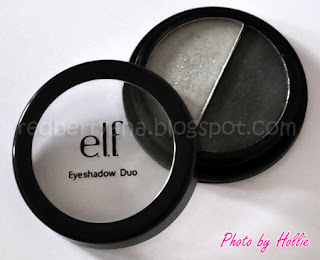 I was looking for a sheer gray eyeshadow shade last December 2010 and found this beautiful silver/charcoal shade from the elf Duo Eyeshadow collection. I think these shades are "Must Haves" in your makeup collection. * I am clumsy, so the packaging needs improvement. The cover falls off every time I use it. The flip type covers are much easier to use as compared to this twist type packaging. * the products is a little chalky or powdery, so this could get messy if you're not careful. In conclusion, this is a very good staple makeup. I'm sure you can't find anything else with this quality, considering it's price. Everybody should have these shades. It's very suitable for smokey looks and it also goes well with my other palettes, so it's really nice to have this. You can also check out my review on the elf Brightening Eye Color to get more details on their eyeshadow quads. I will probably buy the Blueberry shade since I don't have blue shades available in the eyeshadow palettes I currently have. I would love to have all shades but I feel like it's a waste if buy them since I already own similar colors. 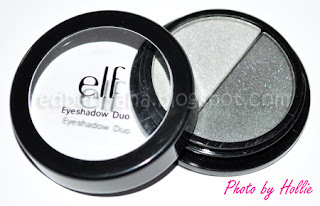 The packaging is cheap but ELF shadows are good though. I like the jumbo eye pencils. Have you tried those? What primer did you use? It looks good! It bugs me whenever I click your page, it leads me to a Twilight page. I was like, WTH!? lol. @Toni, I've never seen their Jumbo pencils. I just used their Studio Eye Primer & Liner Sealer. That's the only primer I own. I'm still waiting for my elf mineral primer to arrive. hmmm about the twilight think, I'm not sure why it redirected you to a Twilight page, that's odd...hahaha. I know, I just clicked your page again and it led me to a salon page. Random ads pop up when I click your page and it directs me elsewhere. yeah! I agree with Toni, it always does that to me to. and I figured you didn't know about it. but my technique on viewing your page is right when Your page loads, your banner will load, and I click on it to refresh again into your orignial blogpage and it neglects the pop up add that's about to load up. but it is tricky, as I have to do it a couple times. I have to be ready with fast reflexes. I've played with elf eyeshadows. They're great for the price it is. and I applaud your beauty practicality. With the price, everyone would be tempted to just collect it all, but you know where the line stops and the savings begin. :) because I downright know I would fail. lol. Take a looksie at this. Yeah, My-My said it right! I think maybe you signed up for Google Adsense? It's horrible for a blog page because of the pop-ups! Like My-My, I have to be quick with my reflexes and not touch my mouse while your page loads or else it will lead me elsewhere again. I'll be sure to check that problem out gurls. I'll fix it asap. Thanks for the heads up! Yep, will check on this pop-up think now. I hope removing Adsense will fix it. @Pammy... Thanks! 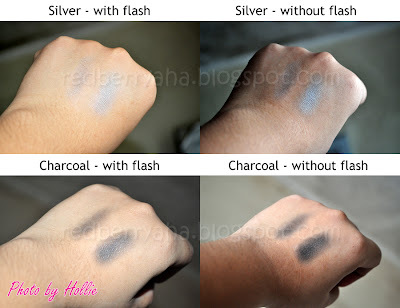 I have yet to try those wet n' wild eyeshadows. I've heard and read so many good reviews about it. I love e.l.f.! They have the best products for the best prices!! Now it led me to a drug screening kit but that's fine. It's the nuffnang ads! Ignore it. I have the brown one (forgot the name) and i so love it!